The Kuntala janapada was located in southern Maharashtra and northern Karnataka state. According to Some inscriptions Karnataka , the Nandas (400BC to 300BC) ruled Kuntala. So this Janapada was annexed into Magada Empire. So we have very sketchy details about the Janapada. But the information available speaks about the glory of this janapada. It comprised of Kolhapur, Satara, Solapur, Ahmadnagar and Bid(Maharastra), as well, North Karnataka and the Simoga and Citaldurga districts of the old Mysore State. In an inscriptional passage the upper valley of the Krishna is said to be in the country of Kuntala( Mirashi, Studies in lndology, Vol. I, p. 9.). In the Udayasundarikatha of Soddhala (11th cen. AD.) Pratisthana on the Godavari is the capital of the Kuntala country. The Aihole inscription (7th cen. AD.) speaks of three Maharastras, comprised of Vidarbha, Aparanta and Kuntala. It is described as, a seven and half lakh province. The Early Calukyas of Badami and the Later Calukyas of Kalyani were known as Kuntaleshwaras or lords of Kuntala. Satavahanas and Rastrakutas were known as Kuntalesvaras(rulers from Kuntala) . Kuntala Janapada issued coi ns dated to 600 to 450 BC. This is one of the seventeen Janapadas which issued coins before Mauryas. The usual coin from Kuntala has a mysterious design that resembles a system of pulleys. These coins have previously been assigned to the Ashmaka janapada, but are now assigned to Kuntala.Because of the force of the striking of the die on a round planchet, these coins have a scyphate shape.The coins are in copper and Silver. The highest denomination weighing from 6.3g to 7.5g. Their symbols include Scorpion. 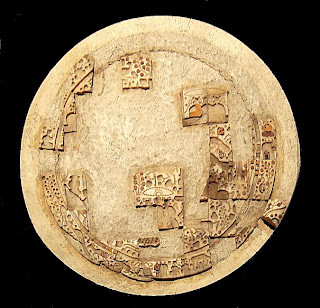 In the City of Ai-Khanoum a artifact called Indian Myth of Kuntala was found, seems to be Astronomical object, specially a narrative plate made of shell inlaid with various materials and colors. Ai-Khanoum (Uzbek language), probably the historical Alexandria on the Oxus, also possibly later named Eucratidia), was founded in the 4th century BCE, following the conquests of Alexander The Greco-Bactrian Kingdom covered the areas of Bactria and Sogdiana, comprising today's northern Afghanistan and parts of Central Asia, the easternmost area of the Hellenistic world, from 250 BCE to 125 BCE. The historic site was destroyed by Taliban.